This blog is a look at how three technologies – solar, batteries and electric vehicles (EVs) – are poised to disrupt a $6 trillion energy industry over the next two decades. I had the chance to sit down with Ramez Naam, the Chair of Energy & Environmental Systems at Singularity University and acclaimed author of the Nexus series, to discuss these major forces and their implications. In 112 hours – less than five days – it provides 36 zettajoules of energy. That’s as much energy as is contained in all proven reserves of oil, coal and natural gas on the planet. If humanity could capture 1 part in 1,000 (one-tenth of one percent) of the solar energy striking the Earth – just one part in one thousand – we could have access to six times as much energy as we consume in all forms today. Solar is already undercutting coal and natural gas in sunny geographies. 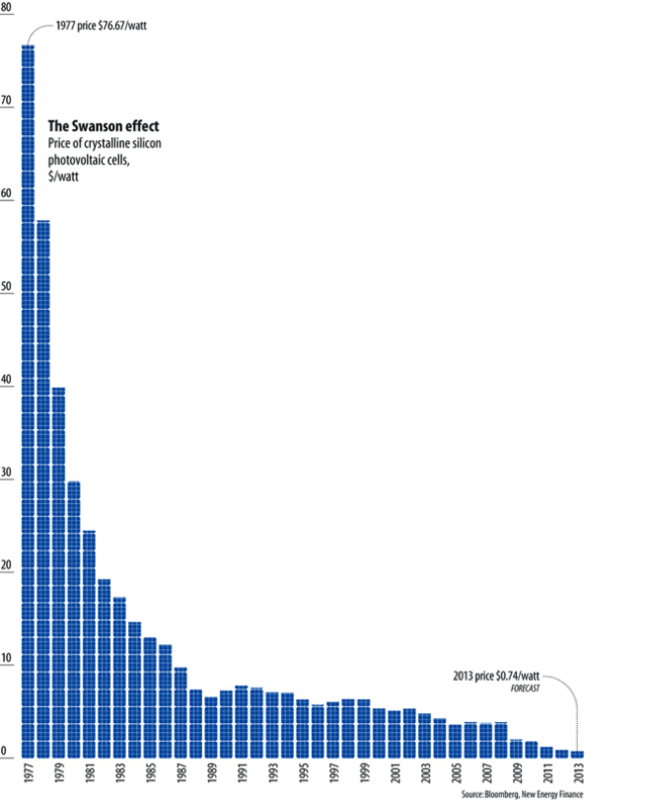 Over the last 30 years, solar module prices have dropped by a factor of 100. Critically -- a new solar price record was set in Chile just a few weeks ago at $0.0291 per kWh – 58 percent less than the price of natural gas from a new plant! And this is just the beginning. How cheap can it get? 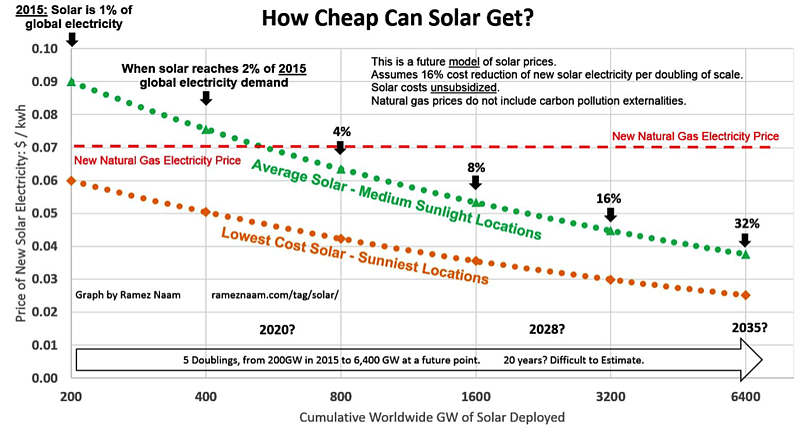 The graph below shows that, if solar electricity continues on its current demonetization trajectory, by the time solar capacity triples to 600GW (by 2020 or 2021, as a rough estimate), we could see global unsubsidized solar prices that are roughly half the cost of coal and natural gas. This is without factoring in the cost of air pollution and carbon pollution emitted by fossil fuel power plants. Of course, one limitation of solar is that it’s only available during the day. We’ll need breakthroughs in battery technology to transition fully into a solar economy. Lithium-ion Technology: Lithium-ion batteries have been seeing rapidly declining prices for more than 20 years, dropping in price for consumer electronic uses by 90 percent between 1990 and 2005, and continuing to drop since then. This price reduction is coupled with an 11x increase in battery storage capacity per $100 since 2000. Scaled Production: The rollout of Tesla's Gigafactory makes $100 per kwh lithium-ion batteries in electric vehicles possible by 2020. This price point would yield an astonishing $0.11 per kWh electricity storage -- or, in other words, allow you to fill up the equivalent of a tank of gas for $9.35. Flow Batteries: Flow batteries are just starting to come to market and have been proven in the lab to operate for 5,000 charge cycles or more. This is a 10x improvement over standard consumer lithium-ion batteries. Compressed Air Storage: Companies like LightSail Energy are creating physical components rated for 10,000+ charge cycles. Time of Use Arbitrage: The U.S. is increasingly going to time-of-use charges for electricity. Right now that means charging consumers a low rate in the middle of the night (when demand is low) and a high rate in the afternoon and early evening (when demand is at its peak, often twice as high as the middle of the night). These are just a few of the developments happening. The real key here is that we are going to see a mindset shift in the near future. It will just be accepted that every home will be powered by a combination of batteries, rooftop solar and electric vehicles (i.e. Tesla's vision)… and we'll gawk disapprovingly at the idea of driving an explosive, expensive and environmentally damaging gas vehicle, and so on. Electric vehicles (EVs) are taking the transportation industry by storm. Within the next two decades, EVs will undoubtedly be the cheapest and most widely used vehicles on the market. Take a look at the chart below. 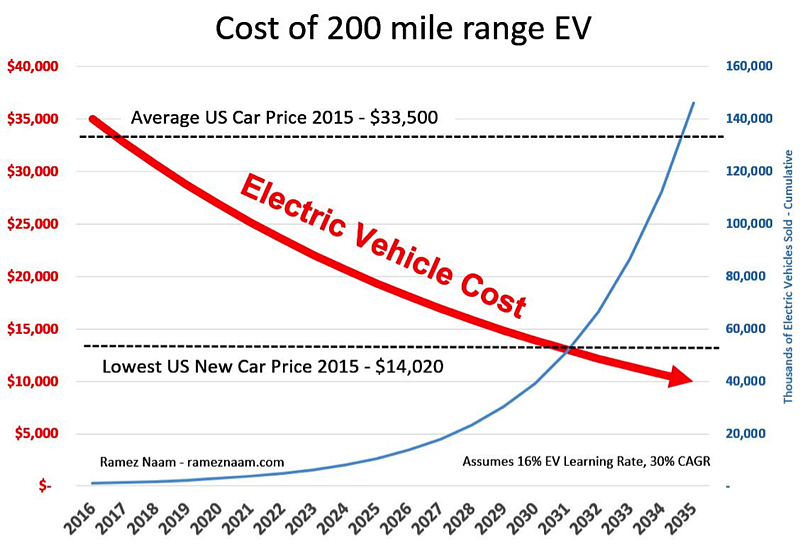 By roughly 2030, EVs with a 200+ mile range are going to be cheaper than the cheapest car sold in the U.S. in 2015. Every major car manufacturer is working on electric vehicles – the number of EV models on the market has grown from 2 in 2010 to over 25 today. The convergence of solar, energy storage and electric vehicles (EVs) creates a trifecta of disruptive forces hitting the energy industry over the next two decades. This raw energy combined with the economic feasibility of solar, advancements in energy storage, and the resurgence of the electric car will allow abundant cheap energy for everyone on the planet. This is an incredibly exciting time for the energy industry, and an incredibly exciting time to be alive. P.S. Every week I send out a "Tech Blog" like this one. If you want to sign up, subscribe here.